Unending Marina & Bay Views From 2 Private Decks! Beautiful 2 Bedroom Condo Steps From the Pool, Enjoy Beach Access! 1. CHECK-IN TIME IS AFTER 4 P.M. CST AND CHECK-OUT IS 10 A.M. CST. NO Early Check-in or late check-out. A half-day rent charge may be assessed if the guest does not check-out promptly. 2. This is a NON SMOKING unit. If the property has been found to be smoked in, a $1,000.00 fee will be assessed. If guest chooses to smoke outside, all cigarette / cigar butts must be removed off property. 3. Pets are NOT permitted in rental property (unless agreed upon at time of booking in an advertised Pet-Friendly property). (A non-refundable pet fee per dog is required. Only a maximum of 2 dogs is allowed at a maximum of 35 lbs.) All dogs must be current on all vaccinations, including rabies (proof may be required), and MUST be treated with appropriate flea and tick control AT LEAST 3 days prior to time of arrival. Non-compliance of these rules and regulations will result in immediate eviction with no return of any and all payments made. 4. AGE REQUIREMENT – No reservations will be made to students or singles under the age of twenty-five (25). One (1) guardian is required for every four (4) singles under the age of twenty-five. Guardians must accompany their children under the age of twenty-five (25) at all times and be present at the time of check-in. Underage drinking and/or partying are not allowed in any of the rental units. Non-compliance of these rules and regulations will result in immediate eviction with no return of any and all payments made. 5. ADVANCE PAYMENT – Upon booking, an advance payment of 50% of the rent + taxes + fees is required in addition to the Damage Protection Insurance (if purchased). Accepted payment methods are VISA, Master Card, Discover and AMEX. a) For extended stays of 30 days or more, we require an initial deposit of $1000. b) Extended stays require half of the final balance to be paid 60 days prior to arrival. c) Extended stays require the final balance to be paid 30 days prior to arrival. 6. FINAL PAYMENT – The final BALANCE is due 30 days before your arrival date. 7. CANCELATIONS – Cancelations that are made at least 60 days prior to stay will receive 100% refund. Cancelation within 60 days of arrival will result in a 100% loss of all monies paid. The loss can be avoided if CSA Travel Protection Insurance was purchased and the reason for cancelation is covered under the travel insurance policy. If you should have to cancel your reservation, please notify us immediately of any cancelation, and if you purchased the Travel Protection Insurance contact CSA to begin your claim. 8. CHANGES TO YOUR RESERVATION – There are no penalties for changing your reservation outside of 30 days prior to arrival. Any changes made to a reservation within 30 days of arrival will be treated as a cancelation (see Section 7). 9. TRAVEL INSURANCE – CSA Travel Protection’s Guest Protect plan is available to purchase through Russell Vacation Rentals. The Guest Protect Plan provides coverage if you need to cancel or interrupt your trip due to a covered event. There are also other coverage’s, such as Travel Delay, Baggage Delay, Rental Car Damage, and Emergency Assistance and Transportation. The plan is optional but we strongly recommend it. NO REFUNDS WILL BE GIVEN BY RUSSELL VACATION RENTALS WITHIN THE 60 DAY PERIOD. For questions concerning the travel insurance or to make a claim, please call CSA directly at 800- 554-9839. The Guest Protect plan cost is 6.95% of the reservation. If you choose to cancel your insurance plan, you can as long as it is within 10 days of purchase and you have not filed a claim or departed on your trip. After 10 days the insurance is non-refundable and non-transferable. 10. DAMAGE INSURANCE - As a part of your stay, you may purchase a Vacation Rental Damage Protection plan designed to cover unintentional damages to the rental unit interior that occur during your stay provided they are disclosed to management prior to check-out. If purchased, the policy will pay a maximum benefit of $3,000. Any damages that exceed $3,000 or are not covered under the plan will be charged to the credit card on file. If, during your stay at one of our rental properties, an insured person causes any damage to real or personal property of the unit as a result of inadvertent acts or omissions, the Insurer will reimburse the Insured for the cost of repair or replacement of such property up to a maximum benefit of $3,000. Certain terms and conditions apply. Full details of the Vacation Rental Damage coverage are contained in the Description of Coverage or Insurance Policy www.vacationrentalinsurance.com/g20vrd. The Vacation Rental Damage plan can be purchased up to, and including at, check-in. By submitting payment for this plan, you authorize and request CSA Travel Protection and Insurance Services to pay directly Russell Vacation Rentals any amount payable under the terms and conditions of the Vacation Rental Damage. Please contact Russell Vacation Rentals directly if you do not wish to participate in this assignment. In the event you do not wish to purchase this plan, a $3,000 damage deposit is required. 11. MAXIMUM OCCUPANCY – The maximum number of guests for this property is limited to a specific occupancy. Exceeding the maximum occupancy will result in immediate eviction and forfeiture of all money paid. 12. NO DAILY MAID SERVICE – While linens and bath towels are included in the unit, daily maid service is not included in the rental rate however is available at an additional rate. We suggest you bring beach towels. We do not permit towels or linens to be taken from the units. Daily maid service is offered under the guest services at an additional cost. 13. CLEANING FEE – A housekeeping fee will be added to all reservations, regardless of the number of nights booked. The fee will vary depending on the size of the property. This is applied for cleaning and laundry services upon departure. 14. NEIGHBORHOOD RULES/HOA – Most homes located in residential neighborhoods are controlled by a Home Owner Association. These associations have very strict rules that must be respected. Most violations warrant a fine that the guest will be responsible for paying. Many rental properties prohibit the on- site parking of recreational vehicles, personal watercraft (boats, trailers, jet skis, etc.) and/or restrict the number of motorized vehicles per rental unit. 15. NOISE ORDINANCE – Quiet time for all properties is 10:00 P.M. until 7:00 A.M., in conjunction with Florida county ordinances. Please be considerate of your neighbors. Radios, stereos, and all other musical or entertainment devices will be played in compliance with the decibel level. The decibel levels cannot exceed fifty (50) decibels between the hours of 10:00 P.M. and 7:00 A.M. outdoors. Music played inside may not be heard outside of the property with the doors and windows closed. At 10:00 P.M., all guests not staying at the property need to depart from the premises. 16. POOL POLICY – Diving or jumping into the pool or hot tub may result in head, neck, or spinal injuries. The renter accepts all risk of the pool or hot tub and specifically agrees that no minor will swim unaccompanied by an adult. Community or condominium pools or hot tubs are not controlled or maintained by Russell Vacation Rentals, and cannot be held responsible for any inconvenience resulting from the pool or hot tub. Pools and hot tubs have electrical/mechanical components. These components can sometimes malfunction. Russell Vacation Rentals, its Vendors, and the Homeowner cannot be held responsible for any malfunctioning pool or hot tub. Please inform us as soon as possible if your pool or hot tub is not working properly. No compensation will be given for a malfunctioning heater. Russell Vacation Rentals will do everything in its power to rectify any problems with malfunctioning equipment as quickly as possible. A fee is required to heat private pools and or spas. a) Owners and Managers of this property are not liable for loss, damage of property, injury to me or my guests during my stay on the premises. b) I hereby release, waive, discharge and covenant not to sue the owners of this property, its officers, staff, agents, or employees for any liability, claim and or cause of action arising out of or related to any loss, damage or injury, including death that may be sustained by me or to any property belonging to me arising out of use of the house or property. c) Indemnification: Guest & their party agrees to indemnify and hold harmless Russell Vacation Rentals and its employees, from and against all claims, suits, damages, costs, losses and expenses arising from injury to any person or property occurring on or about the Property. 18. 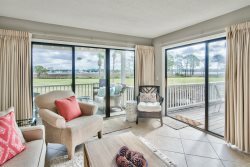 Russell Vacation Rentals makes every effort to make sure your vacation is completely hassle free by keeping each vacation property and its mechanical equipment in top condition. However, we cannot predict when a mechanical problem might occur. Should you experience a problem, we will make repairs as soon as possible. No refunds or rate adjustment will be provided at any time for mechanical failures (air conditioning, heating, television, internet, kitchen appliances, power outages), golf cart repairs or malfunction, pest intrusion, weather conditions, or any condition beyond Russell Vacation Rental's or its vacation property owners’ control. 19. FALSIFIED RESERVATIONS – Any reservation obtained under false pretense will be subject to forfeiture of advance payment, deposit and/or rental money, and the party will result in immediate eviction. By making the initial payment for this reservation, I agree to all terms and conditions of this agreement and rental details below. Non-compliance of these rules and regulations may result in immediate eviction with no return of any and all payments made. In case of any unforeseen events, Travel Insurance helps protect your vacation investment. IF YOU CHOOSE NOT TO PURCHASE THIS COVERAGE, NO REFUNDS WILL BE GIVEN WITHIN THE 60 DAYS PRIOR TO YOUR CHECK-IN DATE. The cost for this protection is only 6.95%.